FORSOOTH! THOU HAST PROVOKED ‘EWWW” FACE! 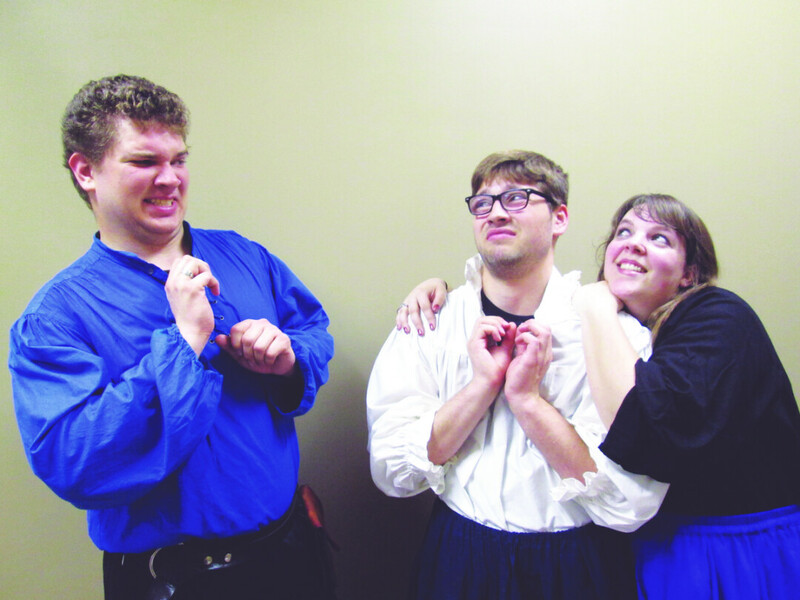 Shakespeare’s Shorts, a locally written and produced take on the Bard, is headed to the Minnesota Fringe Festival. Who are Jim and Jane Jeffries? If you’re from Eau Claire you probably already know them from their annual Comedy Fair where they present their unique brand of original farce and hilarity. The theater company is called Jest Scripts. Jane writes most of the plot and characters and Jim adds the humor. But to audiences of upcoming Minnesota Fringe Festival, Jest Scripts are the new kids in town. And for their long-overdue debut, Jim and Jane are pulling out all the stops. The show is called Shakespeare’s Shorts, and will be a medley of the Bard’s best (and worst) plays. But you needn’t hold a degree in literature or even know who Shakespeare is to enjoy the show. In one hour flat, you will witness (very) condensed and ridiculous renditions of Hamlet (“To be or not to be”), Macbeth (the Scottish Play), Julius Caesar (the one with a lot of stabbing), Anthony and Cleopatra (basically Romeo & Juliet without the awesome), Much Ado About Nothing (like The Parent Trap for adults), Midsummer Night’s Dream (Shakespeare on acid). Yeah, that’s six plays. So by my calculation, each play will be six minutes long. I can’t imagine the chaos backstage and the action on stage is guaranteed to be breakneck ... and hilarious. The production promises “a fast and farcical look at the Bard without all those soliloquies and pesky plot lines.” If you thought the Jeffries and their crew were funny before, consider this their “best of.” They have been testing these plays individually for over six years. They even performed a few at last year’s Renaissance Festival (and not a single Medieval tomato was thrown). Still need another reason to see this play? How about supporting your local artists? A good hometown turnout can be fun in itself. Not to mention, there are a whopping 160 productions in this year’s Minnesota Fringe Festival. So here’s your big chance to see some shows. Many people spend the whole day watching shows, then meet their friends afterward for dinner and drinks to discuss the best performances. It’s called “fringing,” and you should really try it. The Minnesota Fringe Festival runs the first two weeks of August. Show times for Shakespeare’s Shorts are 10pm Saturday, Aug. 1; 5:30pm Sunday, Aug. 2; 5:30pm Tuesday, Aug. 4; 7pm Thursday, Aug. 6; and 10pm Friday, Aug. 7. Tickets are $14. (See www.fringefestival.org for full details.) The show will have its world premiere at The Oxford in Eau Claire at 7pm Thursday, July 30. Tickets are $10. Call it a send off before Fringe.